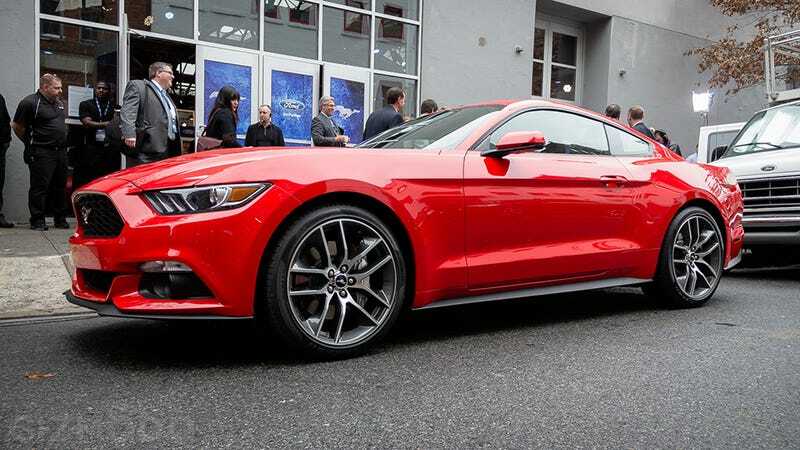 Ford's new Mustang, officially unveiled today, is a technological tour de force. Our friends at Jalopnik had an in-depth tour at what's under the hood, and came away duly impressed. But for a closer read on the car's equally stunning looks, Gizmodo spoke with Moray Callum, director of design at Ford. By now, you've no doubt seen the new Mustang in photos and video. Even my own mother saw the car this morning on TV, two hours before the official unveiling I attended in New York City. Online and in print, it looks great. In person, it looks even better. Moray Callum, who will take over as vice president of design at Ford when J Mays retires at the end of this year, talked to Gizmodo about the particular challenge of making a new, global Mustang without alienating die-hard muscle car fans. "We talked with a lot of people inside [the U.S.] and a few outside, and quite frankly they didn't want anything but a Mustang," he told us. "They wanted an American car. They didn't want us to try and change it, or turn it into something that's not true to the Mustang brand." Still, a svelter Mustang appeals both to performance junkies and the constrained driving environments outside of heartland America. As chief Mustang engineer Dave Pericak explained, this sixth-generation 'Stang sports a lower roof (by 38mm), hood (by 32mm) and decklid (by 70mm). Callum described the trim new sheetmetal as being "shrink-wrapped around the mechanicals." While the look is decidedly more futuristic than the deeply retro designs of the fourth- and fifth-generation Mustangs, it's no less aggressive. As Callum put it, "it's got a shark bite, bluff front end, like a fist breaking through the air. There's nothing subtle about the front of a Mustang. You want to recognize it in the rear view mirror." Ford's design team tucked plenty of historical cues into the car's aesthetic. The three illuminated strakes on the headlights harken back to the tiny louvers in the same spot on the 1964 original. The double-hump dashboard is a Mustang tradition, as are the large, analog gauges. And of course, there are the tri-bar taillamps. Callum told us the rear is his favorite part of the new design. "What we're trying to do is really give people the impression of Mustang, but using modern technology and modern sculpting. Especially the way the [LED] taillamps function, it brings the car into the 21st century." Ford wants the new Mustang to reach past traditional buyers—most often stereotyped as either gearheads or geezers—and attract a younger, non-luddite audience. With smart keys, push-button start, electronically selected driving modes (Normal/Sport/Track/Snow), blind spot monitoring and adaptive cruise control, the new pony car packs the kind of tech buyers expect in luxury-sport cars from Europe and Japan. Ford's choice of venue for the NYC unveiling shows how the company wants the Mustang to break out of its loveably scruffy, unrefined past image. In a stark Chelsea gallery on a street where aesthetics seem to be the only form of commerce, the new convertible 'Stang looked appropriate in a way its musclebound forebears never could.